A DEFENCE LAWYER at the Michaela McAreavey murder trial has told the court that he believes the “real culprits” of the murder are still at large. In a closing argument before the jury retires to make its decision, the lawyer was also heavily critical of the police investigation into the murder and the absence of any incriminating evidence against his client. “The investigation should be reopened,” Sanjeev Teeluckdharry told the court, “because we owe it to the family of the victim”. The defence counsel maintains that the counsel for the prosecution has been unable to prove the guilt of the accused. Teeluckdharry told the jury that the prosecution had focused on two main points: the purported confession of Avinash Treebhowon, and the testimony of witness Raj Theekoye. “Why are we still here,” asked the defence lawyer, who argued that investigators at the Major Crime Investigating Team arrested scapegoats and that the real culprits are still at large. He [the prosecution lawyer] wants us to congratulate [the] assistant commissioner of police for confusing speed with haste, for causing catastrophic errors in its investigation, for not having interviewed those who lived in the surrounding rooms, for failing to investigate premature departures of some hotel guests, for failing to check the alibi of my client. “He wants us to congratulate the head of the MCIT for overseeing the investigation?,” he told the nine members of the jury. Teeluckdharry also argued that his client’s confession was “fabricated from scratch” by police investigators. He noted what he called “inconsistencies” in the recorded testimony on 13 January 2011 and said that his client was tortured. Referring to the conclusions by the chief forensic police, the lawyer explained that the victim had a wound on both temples. This element, he told the court, proved that the purported confessions of Avinash Treebhowon did not corroborate with the coroner’s report. “According to my client’s alleged confession, he would have pushed the victim and she fell to the ground. But how is it that she had two wounds on right and left temples?” he asked. Plucking a few notes from a purse would only have taken a few seconds. Why did my client have to go to room 1023 to check if there was any person on the terrace of that room and room 1025? It would have been so simple to just go on terrace of room 1025 or even simpler to move the curtain to have a look. Commenting on the forensic DNA report which was brought before the court, the lawyer argued “the absence of DNA of the accused on the scene proves they are innocent”. “I have great respect for the victim’s relatives. I admire the courage with which they have faced such a tragedy. I had no intent to injure or accuse anyone whatsoever, but I know that both people in the dock are innocent,” he said. Teeluckdharry said he regretted that several “key witnesses” were not interviewed, particularly a former bellboy who was with John McAreavey when he discovered his wife’s body, and called for the police investigation into the murder of the 27-year-old to be reopened. He told the court that he regretted that in spite of many requests, a lot of material such as CCTV footage had not been communicated to the defense by prosecution and was only made available when a police chief was cross-examined in court. Teeluckdharry said that he believed that John McAreavey was evasive during his cons-examination at the court. Lawyers for the second accused man, Sandip Moneea, argued that there had been much argument about the timing of events on 10 January 2011 and yet “no test has been done to check the real time” when events occurred. The lawyer said that the prosecution had blamed their own witnesses when they were not in a position to answer in court, or answered against their own interests. He ridiculed the prosecution for being prompt to identify a German couple in the CCTV footage showed in court but “did not found it necessary to question another German couple who volunteered to testify about what they had seen near room 1025 at about the crime time”. The lawyer said that the hotel management had offered the services of a translator to help the police but this was declined. Rama Valayden, the lawyer for one of the accused, was also very critical of the professionalism of the MCIT saying that they had completely discarded all forensic evidence such as DNA reports, fingerprints on the door, footprints on the bed sheet and fingerprint on the sunglasses of Michaela McAreavey. Valayden said he failed to understand how the only person apart from Michaela and John McAreavey whose DNA was found in the room, the security officer Dassen Narayanen, was not called even as witness in this case. The lawyer claimed that the only reason the two accused were in the dock was because a “scapegoat has to be found” and they were ideal, “being poor and uneducated”. The judge will deliver his summing up on Thursday. The nine-member jury will then deliberate. The verdict is expected on Friday or early next week. 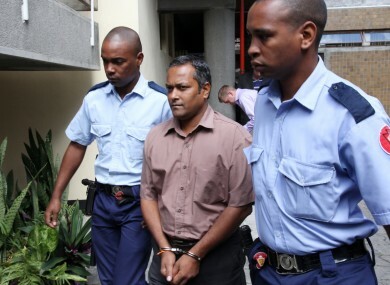 Both of the accused, Avinash Treebhoowon, a former room attendant, and Sandeep Moonea, a floor supervisor, have pleaded not guilty to the murder of 27-year-old Michaela McAreavey in her hotel room during her honeymoon in Mauritius in January 2011. Email “Michaela murder trial: defence says 'real culprits' are still at large”. Feedback on “Michaela murder trial: defence says 'real culprits' are still at large”.